The Kyocera Mita FS-1100 is an office printer that offers improved speeds and sturdy reliability that few printers in its class can match. Packed with a sleek yet robust design that is sure to satisfy office users that also look for printers that please the eyes, the Kyocera Mita FS-1100 may even surprise skeptics with its performance and low cost efficiency when it comes to print consumables and production. The Kyocera Mita FS-1100 a fast desktop printer that is perfectly suitable for home or office users who need reliable performance from printers without any hassles and complications. The Kyocera Mita FS-1100 is simply fast and reliable, registering print speed up to 28 pages per minute. It’s a significant improvement over the FS-1030 series that only yields 23 pages per minute on a good day. Aside from speed, the Kyocera Mita FS-1100 also features a 32MB memory + ECOmemory, another Kyocera patent. Its processor is a PowerPC 405F5 with 360 MHz, certainly capable of maintaining the printer speed consistently and efficiently. It’s even powerful enough to produce first print output in 6 seconds or less, another significant upgrade over the FS-1030. Another impressive feature of the Kyocera Mita FS-1100 is its controller language. It uses the PRESCRIBE IIe that enables the Kyocera Mita FS-1100 to handle even complicated graphics and allow saving and updates within the printer independently, which lessens complication on the work to be done with the Kyocera Mita FS-1100. It also features remote monitoring from a PC through its KM-NET Viewer, which is very handy especially for a busy workplace. The design of the Kyocera Mita FS-1100 is also remarkable, without any unnecessary protrusions and can quite blend in seamlessly with other office devices. This is significant especially for users who like to work in a clutter-less environment. The Kyocera Mita FS-1100’s dimensions are 375 x 393 x 250 mm and weighs relatively light at roughly 10 kilograms, or 22 pounds. Design finish features a sleek, minimalist combination of black and off-white colors for its main cassette and body, respectively. The Kyocera Mita FS-1100 also adds a nice LED control panel display for easy configuration and customization of printing jobs. Resolution for the Kyocera Mita FS-1100 is at 1,200 x 1,200 dots per inch, which allows it to produce crisp and detailed print outputs. it also has an option for output memory storage through its CompactFlash card slot that can handle up to 2 GB of memory. Users can use it to store forms, fonts, logos and other files. 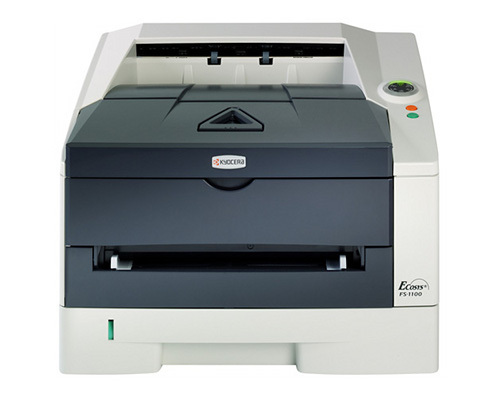 Kyocera printers are also known as environment-friendly printers, and the Kyocera Mita FS-1100 is no exception. It employs ECOpower saving features to allow the Kyocera Mita FS-1100 to save up on power consumption. When enabled, the Kyocera Mita FS-1100 only uses roughly 4.4 watts. The Kyocera Mita FS-1100 is a remarkable desktop printer, save for some features, notably its noise production to name one. With a 53 decibel level while printing, the Kyocera Mita FS-1100 is a bit noisy, and this is especially a downside for home users who usually prefer quiet production when it comes to their printers. Paper capacity is also not as impressive compared to other printers, with the Kyocera Mita FS-1100 only able to handle a maximum of 500 sheets on its input and output capacities combined. While manual duplexing for the Kyocera Mita FS-1100 is available, most desktop printers already offer automatic duplexing which takes away much of the burden in printing on both sides of any chosen medium. 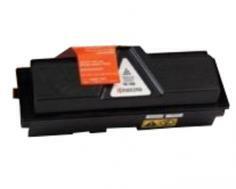 Ink, Toner, Cartridges & Supplies. Review it: "Kyocera Mita FS-1100 "
The Kyocera Mita FS-1100 has a duty cycle of 20,000 pages per month, with a recommended average usage of approximately 2,000 pages. While not exactly a high-volume printer, the Kyocera Mita FS-1100 should satisfy low to moderate print production needs. The Kyocera Mita FS-1100 also ships with a starter toner with 2,000-page yield. Its TK-140 Toner Kit on the other hand includes a microfine toner that has a 4,000-page yield. 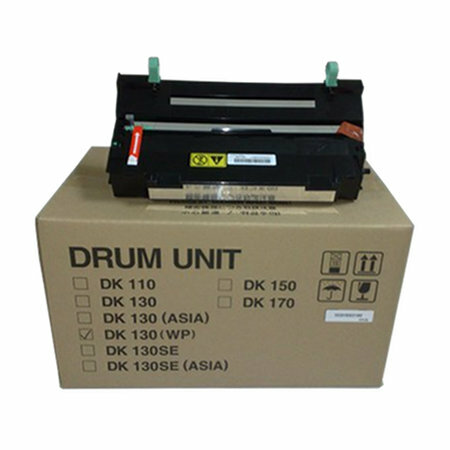 Kyocera also guarantees drum unit and developer for 3 years of usage or approximately 100,000 pages before requiring any replacements.